For as long as I can remember Black Friday has been the ultimate weekend for Christmas shopping. Every year, I refrain from buying anything for myself in November or December so I can focus on family and friends I should be shopping for. In a few weeks the tradition will be carried out, but with a new wish list in mind, as to be expected. Getting the same gift for someone twice is something you definitely want to avoid. If that’s tricky for you, my method may help with brainstorming new ideas for all the ladies in your life. Between Spiritual Gangster, Walmart and Bare Minerals, shopping for my loved ones will be a breeze. High-quality yoga clothing can be costly. Luckily, Spiritual Gangster Black Friday deals are off the chain. Score forty percent off everything, and not just for a single day. Get the same hookup on Spiritual Gangster Cyber Monday too. These are the cheapest prices I see all year. From women and men’s graphic tees, tanks, hoodies and sweatshirts, to accessories and items already on sale, Spiritual Gangster has Black Friday deals everyone can enjoy. We all know Walmart has “doorbust” worthy deals, so why not plan ahead and save big on all your gifts. I recommend using the sale for tech gear. You’ll find up to 60 percent off flat-screen TVs, laptops, phones and more. The best part is, this year you don’t have to wake up early and wait in line all morning to score deals. 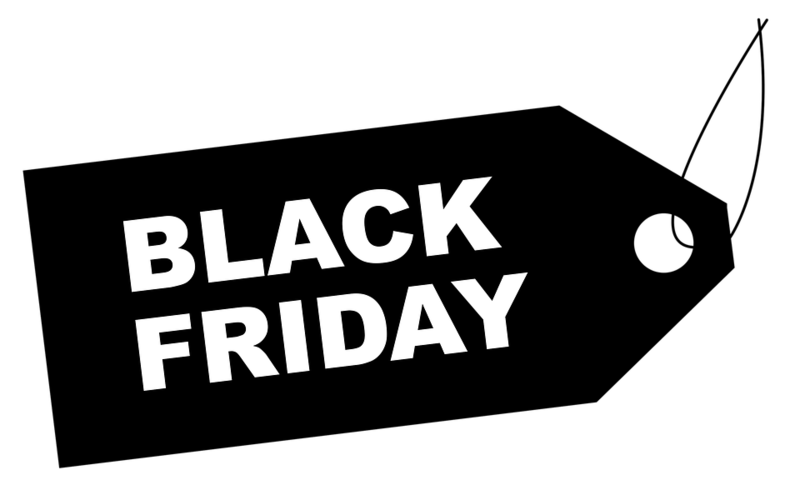 Walmart will be celebrating Black Friday all weekend, in stores and online. I have three sisters, two moms and lots of girlfriends. Luckily, they all like makeup. Each year I browse the Black Friday Bare Minerals mega-package deals and pick out one with 40 or so pieces. I open it up, split the makeup into ten or so presents, and everyone gets high-quality makeup, but I spend less than 100 bucks. Following the Black Friday tradition can be done in a selfless manner. Shop for friends and family during the sale and you’ll save hundreds on Christmas gifts — not to mention continue the Thanksgiving spirit. For my fellow shoppers, I hope this guide helps you find the best gifts at the best prices. Good luck! Over the next two weeks, Colorado State University’s 350 Club will be hosting the Fossil Free Film Festival to help raise awareness about climate change and to promote sustainability on campus. The 350 Club is a new student organization, but there are various 350 chapters all over the nation. President Sophie McVicker, a junior studying natural resource recreation and tourism, founded CSU’s branch of the 350 club. She became interested after attending a Fort Collins 350 meeting and decided the University needed its own club. The club is always looking for new members to come together and support environmental issues. McVicker said they will focus on climate change activism. The film festival will be the first event that the club hosts, but McVicker thinks it is a good step towards convincing CSU to divest in energy other than fossil fuels. “We put so much effort into this event that I am confident it will draw more people in,” McVicker said. Tuesday, Dec. 1 in Behavioral Sciences Building room A101 at 7 p.m. This event will feature three guest speakers, followed by the film Chasing Ice. Scott Denning, from CSU’s Department of Atmospheric Science, and two State Senators John Kefalas and Matt Jones will deliver speeches. Thursday, Dec. 3 in Behavioral Sciences Building room A101 at 7 p.m.
Saturday, Dec. 5 in Behavioral Sciences Building room A101 at 2 p.m.
Part two of Global Connections will feature the film This Changes Everything. Monday, Dec. 7 at Avogadro’s Number at 7 p.m.
Next week will kick off with two local speakers, Sam Schabacker from the Food and Water Watch and Fort Collins City Council member Ross Cunniff. The night will also include two documentaries about fracking, Dear Governor Hickenlooper and Groundswell Rising. Wednesday, Dec. 9 in Behavioral Sciences Building room A101 at 2 p.m. This event will be hosted by the CSU Sustainability Center and will include a musical performance by Elizabeth Hudetz, keynote speaker Stacia Ryder and two films. First they will air Last Rush For the Wild West, followed by Split Estate. Saturday, Dec. 12 in Behavioral Sciences Building room A101 at 2 p.m. The final night of the Fossil Free Film Festival will consist of three guest speakers and two films. Chuck Kutscher, from the National Renewable Energy Laboratory, followed by Fort Collins State Rep. Jeni Arndt and State Rep. Max Tyler, who is also Chair of the House Transportation and Energy Committee. This article was published in The Collegian December 1, 2015. Looking for other fun things to do in Fort Collins? Check out Groupon’s new page made just for us Rams! The process food goes through before it arrives at the grocery store is crucial for consumers to understand if they would like to lead a healthy lifestyle, according to members of Assistant Professor Michael Martin’s AGED 330 class. The class hosted an event Tuesday on the Lory Student Center plaza to educate the Colorado State University community on the production of food. AGED students and members of agricultural clubs came together to answer any questions that people passing may have relating food. Brett Arnusch, a sophomore agricultural education major and a member of the AGED 330 class, helped organize the event. The class voted on several ideas mid-semester to educate their peers on the food they eat. Since then, the class has worked to bring all the different agricultural clubs together. Initially, the class planned on having Cam the Ram with them on the plaza to help attract students. “It turned out to be smaller due to weather, but we just wanted to show the non-ag students at CSU what’s actually going on in agriculture,” Martin said. The idea of the project was to look at food production from a new angle: Rather than asking yourself how certain foods ended up on your table, think about how they were produced and in term where they are being shipped from. Several groups ran booths on the plaza to reach out to students. Representatives from the CSU Collegiate Farm Bureau Chapter, Alpha Gamma Rho, Ag Ed Alliance and the CSU Agronomy Club came together to provide nutritional education. Macy Child, a junior studying soil and crop sciences, represented Ag Ed Alliance as she answered student questions about hormones, pesticides and anything else regarding food. This article was published in The Collegian November 17, 2015. Some students may have noticed the rust accumulating under the bridge that connects the Lory Student Center to the Engineering building. Or maybe, after a rainy night, they have been walking to class and gotten dripped on. As members of a senior civil engineering design class at Colorado State University, Jerome Brunelle and his team are designing a plan to reconstruct the 37-year-old bridge. “There are a lot of parts where it leaks, it’s broken and rusted out in a lot of spots, and a lot of people just don’t think it goes with the design of the new LSC structure,” Brunelle said. The proposal includes a student fee increase to fund the project. It has not been submitted for review or considered for approval yet. To share your opinion with the designers, take the online survey. Senior engineering majors Tanner Waldron, Samantha Katz, Ian Swensson, Matthew MacDonnell, Amanda Higley and Jerome Brunelle are all working on the Lory Student Center Engineering Building Connection project proposal. Chris Thornton, an associate professor at CSU, teaches the course and it takes a full year to complete. The first semester student teams build proposals, and the second semester they create and finalize designs that they hope the University will consider. Brunelle will be focusing on the aesthetics of the bridge and the bridge canopy. To gather student input, Waldron designed a survey for the CSU community. It will be used in reference as to how often students and faculty use the connection and what designs they would like to see. Waldron will design the bridge. He hopes to work in design at a structural engineering company when he graduates. For him, the project is great practice. “All civils have to take this class and it definitely helps you gear towards your future as an engineer,” Waldron said. Cam the Ram will be on the Lory Student Center Plaza Tuesday to help teach students about nutrition. Students will be on campus from 10 a.m. – 2 p.m. answering any questions students may have regarding food. Cam’s Ag Experience will be hosted by Colorado State University’s program design and evaluation in agricultural literacy class, AGED 330. AGED 330 is taught by assistant professor Michael Martin. Danielle Wesolowski, a senior agricultural business major and a member of the class, helped organize the event. Clubs from the College of Agricultural Sciences will be on the Plaza to help answer questions. To learn more about what goes into your body on a daily basis, stop by the Plaza Tuesday and visit with Cam. This article was published in The Collegian November 16, 2015. Is your phone charger sitting at home plugged into the wall right now? Yeah, so is mine. 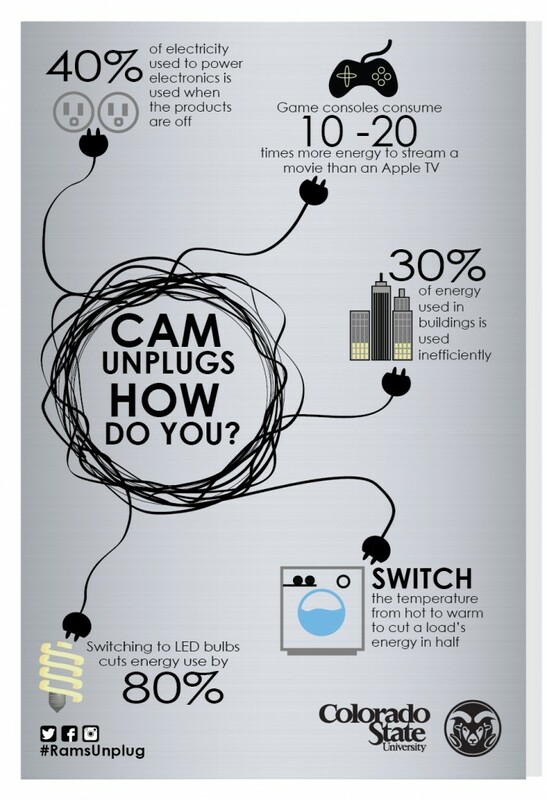 Forty percent of all electricity is used to power electronics that are off or not connected, according to statistics provided by the Rams Unplug campaign. Five Colorado State University journalism students, Brian Waugh, Julia Adams, Pamela Shapiro, Erica Grasmick and Lucy Skrobacz, have come up with a plan to help CSU reduce its carbon footprint. Rams Unplug is an awareness campaign designed to initiate better electricity conservation habits on campus. CSU set goals to become carbon neutral by 2050 through the Climate Action Plan — every carbon emission the University releases will be counteracted, recycled or reused somehow. Rams Unplug is one of the many steps the University is taking to achieve this. Tom Milligan, vice president of external relations at CSU, guided the group of five students in a public relations workshop as they created the campaign. Electricity use accounts for the largest portion of CSU’s carbon footprint. By practicing sustainable habits, a large amount of electronic waste can be controlled. The campaign is encouraging students to limit electronic waste at CSU and practice unplugging cords when they are not in use. “We’re trying to focus in on those first-year students so that they can hopefully build those habits and take them, whether they live on campus next year or off campus,” Skrobacz said. Waugh said he has learned a lot about electricity use that he never would have known before the project. This article was published in The Collegian November 10, 2015. At a groundbreaking event for the new biology and chemistry research buildings, Colorado State University celebrated the construction of what will be known as the gateway to discovery, according to Dean of the College of Natural Sciences Jan Nerger. The new buildings will be located south of Pitkin Street next to the Anatomy-Zoology building, serving as an entrance to the new Science Mall. President Tony Frank addressed students, staff and other community members to celebrate these two projects. Frank said the new buildings are like blank pages in the story of CSU. “(As) long as we stay focused on the mission of discovering new knowledge, passing that to the next generation and applying it for the benefit of the society we exist to serve, whatever happens in those buildings, whatever is written on the pages of that next chapter, will be something we can be proud of,” Frank said in his speech. The Biology Building will cost $70 million. It was partially funded through bonds, but $57 million came from a student facilities fee. The building will feature enhanced classrooms and state-of-the-art research labs. There will also be a lecture hall and an advising center. It will occupy 151,560 sq. ft. and will be ready for student use in August 2017. Tracey Abel, facilities management project manager for the biology building, said she is excited to break ground. The Chemistry Research Building is being funded by the State of Colorado. It is a multi-phase funded project scheduled for completion August 2017. The new research facility will be 60,000 sq. ft., located next to the new Biology Building. Megan Neufeld, a graduate chemistry student, said she is happy to see the University expand its resources for scientific purposes. Sam Laffey, chair of the University Facility Fee Advisory Board, and Jason Sydoriak, president of the Associated Students of Colorado State University, spoke at the event, representing the student body. Sydoriak said the new buildings will give the community a tangible idea of what the University believes CSU should look like in the future. This article was published in The Collegian October 16, 2015. For most students, living in a dorm can be loud and space limiting. Sophomore Josh Weemes manages to fit a small recording studio into his. Weemes started rapping last year when he lived in Durward Hall. Now he is a RA in Corbett Hall where he still records music. His fans know him as Emprovyze, and for now his tracks can be found on Soundcloud. The newest Emprovyze track, “Oceans,” was recorded out of Corbett. Two of his other songs, “Dude…Where’s my ship?” and “The End,” were recorded in Durward. Weemes pays for his education on his own, as well as the finances involved with making music. He has to buy the beats he raps to, purchase the equipment he records on and in the future he wants to get some real studio time. It was only about five months ago when Weemes started recording his music. After his friends recognized his passion for the written word, they convinced him to try rapping to a beat. It came naturally and he has been hooked since. When he began, he was a freshman studying journalism, living on campus and recording when he could. Zach Hussey, Weemes’ floormate at the time, said he could hear him rapping last year when they lived on the same hall. Since then, his fan base has grown to more than just friends. He said ten percent of his plays on Soundcloud are international, and he receives fan mail and comments from people all over the world. Currently Weemes is in the process of talking to booking agents to arrange some smaller scale shows. He hopes this will help expand his fan base and spread the music. Freshman Josh Dorsch went to high school with Weemes before he became Emprovyze. They have grown closer since coming to CSU, and Dorsch thinks he has a good chance of blowing up. Weemes does not fit in to the average rapper stereotype, so gaining respect from his listeners has been hard. So far it seems to be working out. His new song released less than a month ago already has 400 plays on YouTube and almost 1,000 on Soundcloud. This article was published in The Collegian October 14, 2015.